For anyone who is stumbling across us for the first time, we are running a two-player, 100 deck tournament to determine the best deck of the decks that we own. We each purchased 50 decks of KeyForge when it was released and wanted to determine a way to see which of those decks would be the best. Shortly into the planning phase, we decided that we should stream and record the games for the KeyForge community at large. For Round 1, we took the 100 decks and put them into 4 deck ‘pods’ that were played in a round robin format. Decks that finished with 2 or 3 wins were moved to the next round while decks that finished with no wins were moved to our “Worst of the Worst” bracket. For the second round, we took the remaining decks and repeated this process to narrow down the field to something we could make a double elimination bracket out of. Almost all of Round 1 has a corresponding write-up that can be found on this website, and I will eventually get around to finishing the write-ups for those last few pods. Round 3 is going to start on February 10th, at 7:30 EST. We will be playing around 6 games each stream until the tournament has finished. We currently estimate that this will take approximately 8 or 9 sessions for us to finish. To celebrate the tournament and to thank all of our supporters, we are going to do a giveaway to coincide with the third round of the tournament. Predictions can be submitted through Challonge and we will give a deck away to whoever has the best bracket. Depending on participation, we may increase the prize pool. This contest is free to enter to anyone who wants to participate, and there are no strings attached to the entry. This round of the tournament featured a lot of high-quality games. Most of the pods we ran had several really close games. There are a few decks that stand head and shoulders above the rest of the competition, but the decks in the round were pretty evenly matched. KeyForge really shines when the decks are good matches for each other. Aember control is the most decisive factor in the the games we have played. The simple explanation is that if the opponent can’t forge a key, they can not win the game. Quite a few of our games have come down to both players with 2 Keys and six aember, and the person who wins is the one with the last answer. Worst Case Scenario: the opponent plays the turn they were going to anyway. 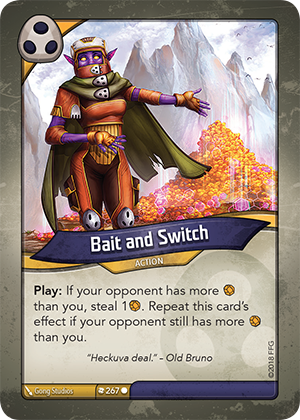 There are several cards that have really proven to be quite powerful: Control the Weak and Bait and Switch. The community at large is well aware of these, so it is not a surprise to hear that these cards played pivotal roles this round. That is not to say that the cards are unbeatable. One of the nastier decks, Sov Wornvector Parmesan, did not escape the second round without a loss despite featuring three copies of Control the Weak. Some of the undefeated decks that have Shadows and Dis in them have no copies of either card. The decks that remain in this tournament play with a lot less ‘clunk’ than some of the worst decks. ‘Clunk’ is an affectionate term that Justin and I use to refer to decks that can’t seem to get out of their own way. A ‘Clunky’ turn is one where the player has to name a house to play cards that don’t do much to affect the board but free up space in the hand. We found ourselves taking fewer clunky turns as the tournament has progressed. Four decks have not dropped a game since the beginning of the tournament. I think there is a strong chance that one of these four decks will win this tournament, based off how dominate they have been so far. I do want to spend some time talking about each of these since they have separated themselves from the field. It is worth noting that not a single one of the decks features Mars. The Innkeeper has a special place in this tournament, since it won the very first pod that we streamed. When we revisited this deck at the start of Round 2, we did not know if it would hold up, since we had played so much KeyForge since then. This trusty deck quickly proved itself again, by cutting through the competition yet again. This deck has quality answers and deadly threats. 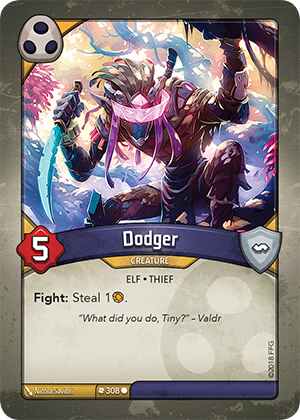 Three Dodgers give this deck ways to fight for the board while controlling the opponent’s aember. The deck has some cross-house synergy, since Ganger Chieftain, Sergeant Zakiel and Brothers in Battle let those Dodgers fight in multiple ways. Shadow Self, Bulwark and Grey Monk provide a nice core of creatures that make the other creatures hard to kill. If the opponent somehow establishes a board that is difficult to deal with, this deck is ready. Coward’s End, The Spirit’s Way and Long-Fused Mines can deal with multiple creatures at once. Hebe the Huge and Veemos Lightbringer kill creatures that might dodge The Spirit’s Way. These board wipes can often be played alongside huge aember generation like Glorious Few or Loot the Bodies. This deck is my pick to win it all. I need to review the stream, but if my memory is correct, there have been about 5 total keys forged against it. This deck is packed with aember control. 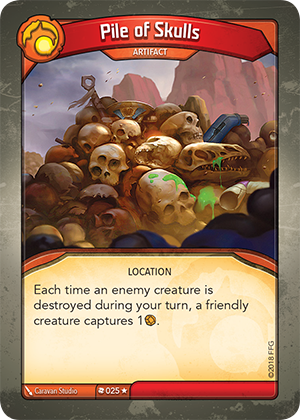 There are fourteen cards that interact with the opponent’s aember. Miasma rounds out the denial package, you know, in case the opponent ends up with enough aember to try to forge. This deck features some of the best synergy I have seen in Dis (as long as you never actually play the Annihilation Ritual). 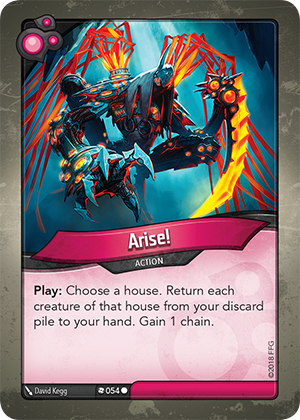 The two copies of Arise! make it very difficult for the opponent to kill all of your problem creatures. The Terror has a very good chance of triggering his ability, since the Shoolers and Charettes can answer up to EIGHT aember by themselves. This deck’s biggest match-up might be against Magnolia, if they meet. Nexus is the only artifact control in this deck, so the Nepenthe Seed + Library Access combo might prove to be too much for this deck. This deck might also be weak to Key Charge combos, since the aember could leave the pool before Christensen could get his grubby Archon hands on it. 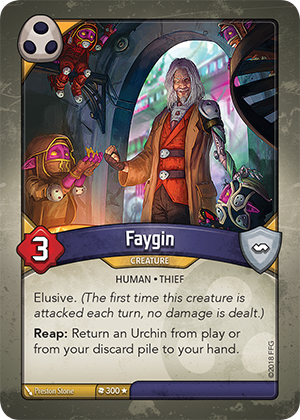 Otherwise, I don’t see this deck losing to any deck that is trying to play a fair game of KeyForge. Olly is exceptional at generating aember, and can probably generate more than any of the other three undefeated decks. Left unimpeded, this deck can win with blazing speed. This deck feels like it is missing a Chota Hazri to be perfect, but it wouldn’t be a KeyForge deck if you got to pick the cards. The Shadows in this deck can be particularly brutal. Faygin is unfair against any player who can not immediately answer him. Duskrunner has a way of finding itself on Faygin in this deck, and it is just as disgusting as it sounds. Even if the opponent answers Faygin, Arise! and Witch of the Eye offer ways to get him back into your hand. The Untamed in this deck is probably the weakest portion, but the massive number of creatures here work well with the deck’s Soul Snatcher. 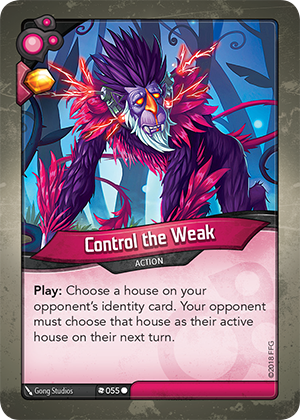 Magnolia is the deck with the Library Access and Nepenthe Seed combo, but in the second round of the tournament, it won without the combo drawing the whole deck. This deck is very capable of winning without the combo, but the combo is an ever present threat. This deck is skill-testing to mulligan with. This deck leans heavily on Pile of Skulls for aember control. 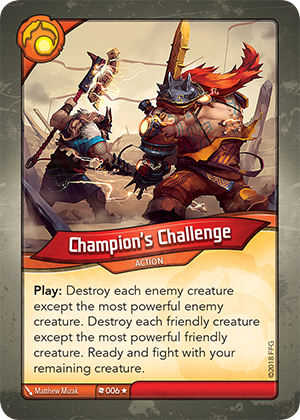 Champion’s Challenge combines well with that, and the Brobnar creatures in this deck are giant monsters capable of fending off lesser beings. Burn the Stockpile, Effervescent Principle, Murmook, Interdimensional Graft and Neuro Syphon round out a non-standard aember control suite for a non-Dis, Non-Shadows deck. There is one double maverick deck in the tournament. Justin and I think this deck is just fun to play. Round 2 was packed with memorable games and memorable plays, and there is more content than I could hope to possibly cover in just one post. Justin won a game by hitting Key Charge off Wild Wormhole. Nathan won a game by calling Mars every single turn. We hope that the playoff round of the tournament can generate just as much excitement. This project has been a lot of fun and we’re glad that we’ve had the chance to provide this content to the community. We want to thank everyone that follows, subscribes or donates to the stream. When we started the stream, we didn’t know if anyone would watch it, so we do appreciate the continued support. Now, lets go find out how the tournament ends.